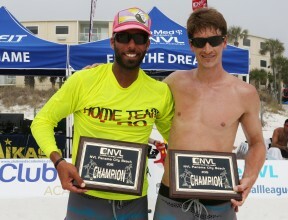 PANAMA CITY BEACH, Fla. (March 21, 2015) – The National Volleyball League (NVL) opened the 2015 Pro Beach Tour in Panama City Beach, Fla. this week with Americans Dave Palm and Mike Placek earning the men’s title, and Brooke Niles (USA) and Karolina Sowala (PL) crowned the women’s champions. This is the first tournament both teams have played together professionally. Palm and Placek defeated the eleventh seeded Puerto Rican team Erik Haddock and Roberto Rodriguez-Bertran, 21-17 and 21-14. Palm continues his success into this season having been named the NVL’s 2014 Breakthrough Athlete of the Year. Placek, a pro beach volleyball veteran, was given the league’s 2014 Appreciation Award. Niles and Sowala came back in the second game to get the win 21-11, 25-23 over seven-seed Vivian Cunha and Raquel Goncalves Ferreira hailing from the Republic of Azerbaijan. Sowala was the NVL’s 2014 MVP & Best Offensive Player and Niles was the Defensive Player of the Year. 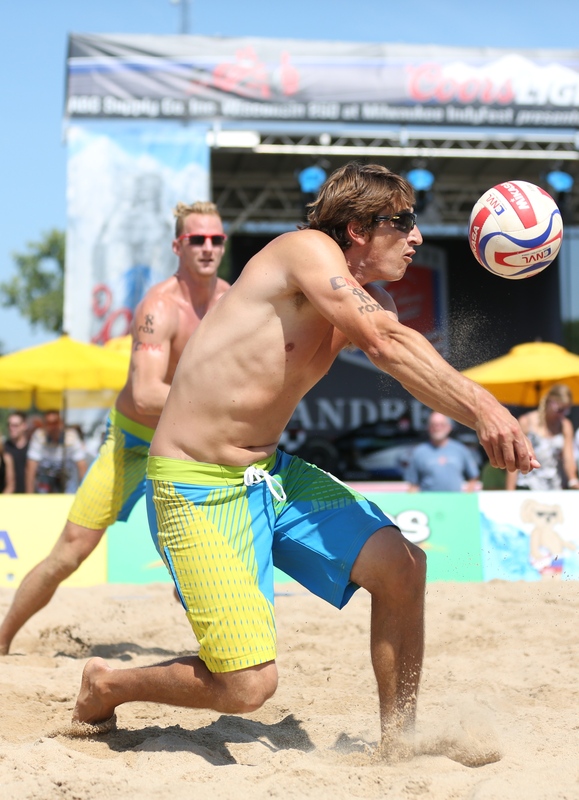 The tournament was hosted at the volleyball courts in front of The Beach Boardwalk Resort from March 18 – 20 and featured some of the top pro beach volleyball players from around the world, competing for a $50,000 prize purse in front of thousands of Spring Break fans. The NVL also held a college coed tournament before the women’s finals and awarded the winners a free condo at The Boardwalk Beach Resort during Spring Break 2016. Saturday, March 21 and tournament on Sunday, March 22. Registrations can be completed on the NVL RIZE website and walk-ups will be accepted if space permits. All of the Panama City Beach Championships matches are available to view free on-demand on the NVL Network. For more information about the NVL, please visit: www.thenvl.com, view the 2015 sizzle reel or follow on Facebook, Twitter and Instagram. Established in 2010, the NVL is a professional beach volleyball league built by players for all players, united in one mission: to create a sustainable future for pro beach volleyball in the U.S. Home to eight professional events in 2015, a grassroots series, and the Club Med NVL Volleyball Academies, the NVL is the only national platform for current professionals and players of all levels to showcase their talents and pursue their aspirations in the sport. With sand volleyball now a sanctioned high school sport, the NCAA’s fastest-growing emerging sport in history with 50 schools sponsoring it as of January 2015 and a Division 1 approved championship, the NVL is building the infrastructure for young players to achieve their dreams.